Nuclear power creates unacceptable risks to our planet. Investing in nuclear energy undercuts our ability to solve our intertwined energy and climate change crises and increases the risk of cancer, nuclear terrorism and proliferation, and contamination from nuclear waste. The growing interest in nuclear energy has been bolstered by the industry’s slick and well-financed public relations campaigns that cast nuclear power as a green technology. Often the industry’s media campaigns feature statements by one of its paid lobbyists, Patrick Moore, wrongfully described as a Greenpeace founder, and the mainstream media buys the greenwashing. A March 2007 piece, “Moore Spin”, reports that a Nexis news database search “identified 302 news items about nuclear power that cite Moore since April 2006” but only 12% of them mentioned that he was now on the payroll of the nuclear industry’s trade group, the Nuclear Energy Institute. The nuclear industry’s touting of nuclear plants as “emissions-free” is particularly disingenuous given their routine emissions of harmful radiation. A recent German study caps the growing list of published medical and scientific studies that link radiation releases from the normal operation of nuclear power plants to increased cancer rates, especially of childhood and breast cancer. During normal operation, every nuclear reactor in the world produces strontium-90 emissions at toxic levels. The danger of nuclear plants’ low-level radiation is explained in the college textbook, Profiles In Power (1997), by Rinaldo Brutoco and Professor Jerry B. Brown, and the Academy’s newest book, Freedom From Mid-East Oil (2007). According to climate scientist James Hansen, we need to take decisive action during the next decade to avoid a tipping point in climate change. This can’t be done with nuclear energy partly because it is an abject economic failure. As Academy Fellow Amory Lovins explains in “The Nuclear Illusion”, “new nuclear power costs far more than its distributed competitors, so it buys far less coal displacement per dollar than the competing investments its stymies.” As a result, “every dollar invested in nuclear expansion will worsen climate change by buying less solution per dollar.” Nuclear power’s life cycle production costs per kilowatt hour of electricity generated are several times that of coal, natural gas, and wind – not including the unknown ultimate waste disposal and decommissioning costs. The nuclear industry creates the misleading impression that electricity from nuclear power is cheap by quoting only the costs to operate plants that are already built and comparing such costs with the cost to operate and construct power plants that use other energy sources. As Lovins points out, cost comparisons of various technologies should be based on the “real levelized cost (over a lifetime appropriate for each technology) per kilowatt-hour delivered to the retail meter.” On this basis, new delivered nuclear power costs about 2 to 10 times more than equivalent firm delivered power from “negawatts” (electricity saved through efficiency or better end-use) and micropower (which includes both on-site generation of electricity at the customer’s site, and all renewable power sources other than big hydro plants). This cost gap will continue to widen with or without carbon taxes or emissions trading schemes, and it would be even wider today if all nuclear waste and plant decommissioning costs could be adequately factored in. Nuclear power is particularly ill-suited to the climate change era because of nuclear power plants’ need for vast amounts of cooling water for both normal operations and emergencies. As the planet warms and droughts spread, nuclear plants located anywhere but on the ocean will compete for increasingly scarce water needed for drinking and agriculture and will not be able to obtain the cooling water they need. Nuclear plants in the United States and Europe had to ramp down or shut down in recent summers after lakes and rivers became too shallow or too warm. Many existing ocean coastal plants will be threatened by rising sea levels. 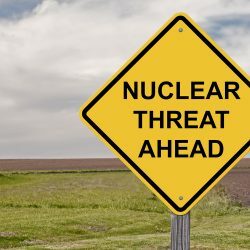 Nuclear power increases the risk of nuclear terrorism. The 9/11 Commission reported that the lead pilot in the World Trade Center attack considered targeting the Indian Point nuclear plant near New York City. A German government study and nuclear plant manufacturer General Electric both concluded that nuclear plants cannot withstand a direct hit by a 737 aircraft. Even a direct hit by a much smaller, rented private jet could cause devastation. Litigation is pending to decide whether U.S. nuclear plants must be designed to withstand terrorist attacks. The pools of spent nuclear fuel often stored on site for lack of permanent waste storage facilities are even more vulnerable to terrorists than the plants themselves. No country has found a millennia-long way to permanently and safely store nuclear plants’ high-level radioactive waste, including plutonium, the key ingredient in nuclear weapons. The waste is piling up at nuclear plants and interim storage sites around the world, where it is vulnerable to diving airplanes, explosives, and theft. The nuclear waste traffic between Western Europe and Russia over the last three decades has left Russia with many thousands of tons of waste stored in insecure and unsafe conditions. Civilian reprocessing of spent nuclear fuel is not the answer. Reprocessing eliminates some but not all of the waste, and converts the remainder into weapons-grade material. In reality, nuclear energy’s role in the world is likely to shrink, not expand. Nuclear power is not the ticket to energy independence. Even if countries want nuclear power, over the next ten years the world cannot build new nuclear plants fast enough to replace the many aging plants already past their design life while adding enough new plants to increase capacity. Peter Bradford, a former member of the U.S. Nuclear Regulatory Commission who participated in the licensing of about 25 nuclear plants, has described the limited future of nuclear power even more bluntly. Bradford said that those who say things like nuclear energy can stop global warming “are inviting you into a dangerous lala land in which nuclear power will be oversubsidized and underscrutinized while other more promising and more rapid responses to climate change are neglected and the greenhouse gases that they could have averted continue to pollute the skies at dangerous rates.” He should know. We should listen. This article is a followup to a previous exploration of nuclear power being unfit to address climate change.